January 18th 2017- The price of electricity in the N2EX market has risen substantially in recent months after remaining at low levels during the first half of 2016. 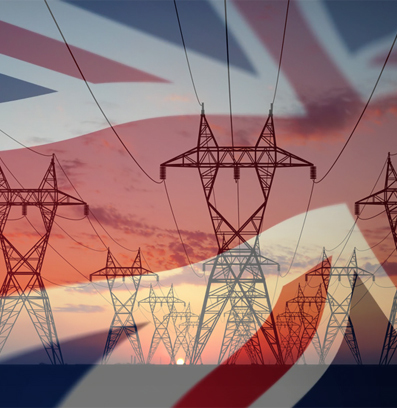 The main cause is the high dependence on gas for electricity generation in the United Kingdom. The British government has launched its “decarbonisation” plans to replace coal-fired production with gas in the energy mix. In addition, the shutdown of nuclear power plants in France during the last months of 2016 has also pushed up the price. Electricity generation in the United Kingdom has traditionally been dominated by coal and gas plants, representing in 2014 about 30% of the generation with coal, and another 30% with gas. Secondly, there were renewable sources and nuclear power plants, with approximately 20% of each type. In 2016 coal generation was below 10%, renewables around 25% and gas above 40%, with data up to the third quarter. The country is in a situation of transition towards electricity generation with low CO2 emissions that is undoubtedly altering the N2EX market. The price of CIF ARA coal has risen considerably in recent months, reaching a monthly average of 87.23 $/t last December. The large supply of coal worldwide had lowered the price of coal during 2015 and, until May 2016, monthly prices remained below 50 $/t. Since then, the price has been rising month after month, mainly due to China’s decision to reduce working days in the coal mines from 330 days per year to 276 days per year, also a generalized reduction of the supply motivated precisely by the low prices. In the case of NBP gas, a benchmark in the United Kingdom, there is also a situation of global oversupply that has kept prices down for most of 2016. 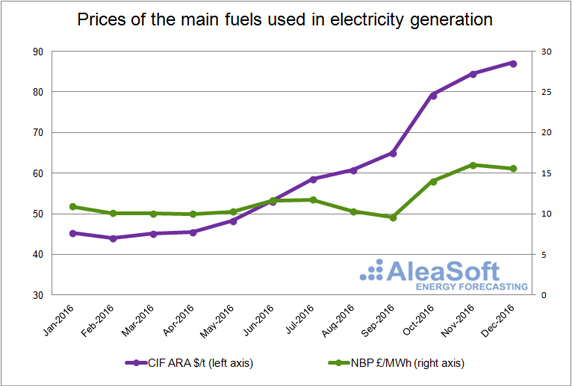 Since October, the monthly price of gas rose above 65 £/MWh due to the price increase of coal. The continued increase in the price of coal contributes to rising price of gas, because, even with the increase, it is still more profitable to use gas than coal for the generation of electricity. In addition, the price jump in October was reinforced by the seasonal increase in demand. Sources: CIF ARA – EEX, NBP – ICE ENDEX. On the other hand, UK government policies are actively supporting the replacement of coal-fired power generation with gas. In order to significantly reduce CO2 emissions they plan to close all coal plants by 2025. In 2016, three large power plants were closed (Longannet, Ferrybridge C and Rugeley) totaling 4.2 GW of power. They also have their own tax consisting of a minimum price of emissions (Carbon Price Support), set at 18 £/t until 2020/21. Since gas production causes about half the emissions of coal per unit of electricity, using gas is clearly favoured. 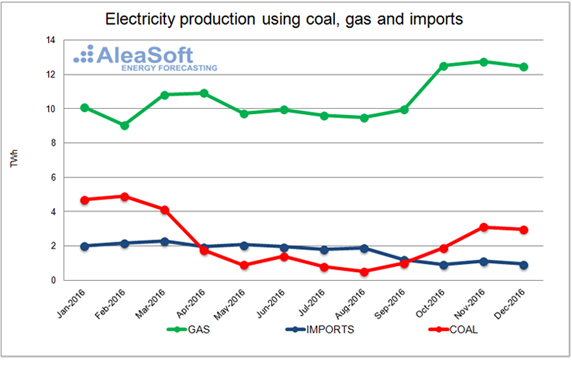 In this case, the production with gas has already been much greater than production with coal throughout 2016. The increase of the monthly production in October was 2.6 TWh compared to the previous month, remaining at 12.5 TWh and is maintained in November (12.7 TWh) and December (12.5 TWh) which coincided with the seasonal increase in demand. There is also a rise in production using coal; however, this is a more gradual increase. The increase in production with gas and coal has also had to replace imports which have been reduced since September. Imports have been reduced mainly in the link with France. 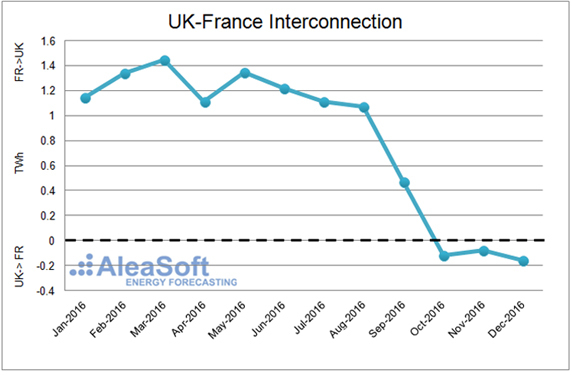 The monthly balance in this interconnection was clearly in the direction of importing energy from France until August 2016 and it then declined until it was a slight exporting balance from October. At the end of November an accident rendered unusable part of the submarine cables of this interconnection reducing its capacity in half. Since then, although the exchanges are smaller, the balance in December still makes the United Kingdom an exporter. It is expected to recover the original interconnection capacity next February. At the end of June the “Brexit” referendum was held, from which the weakening of the British currency against the euro accelerated, making imports of fuels more expensive. The price of electricity in the N2EX market rose significantly from August to November on a monthly basis and declined in December. 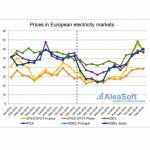 In September, the price of the French market EPEX SPOT-France was already rising along with the price of coal. It was in that month that imports fell and production with coal began to increase in the United Kingdom. The shutdown of several nuclear power plants in France had its greatest effect on the French price in October and November, coinciding with the rise in gas production and the price of gas. The price of coal increased even more and also did the production. The result was very high electricity prices in November at an average price of 59.71 £/MWh. 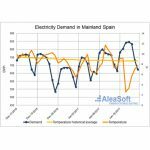 In the last month of 2016, although production with gas and coal was maintained, the price of France fell and according to National Grid data, generation from renewable sources in the United Kingdom increased. This allowed the monthly price in the British market to decline again in December. Sources: EPEX SPOT-Francia – EPEX SPOT, N2EX – NORD POOL. 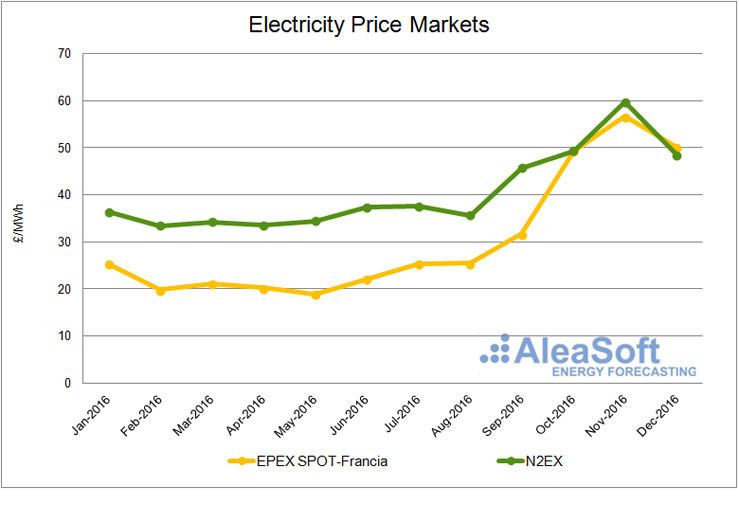 The prices of the EPEX SPOT-Francia market are expressed in £/MWh, calculated from the original values in €/MWh.